Jolly Mon Vacations is proud to announce that we will be cruising on the very first cruise of Scenic Crystal in April. The ship is currently being built-in Amsterdam and will make its way down the Rhine River into Germany this April. We will join the ship in Amsterdam and be the very first passengers to sleep in those luxurious sheets as this ship cruises the Rhine and Moselle Rivers. 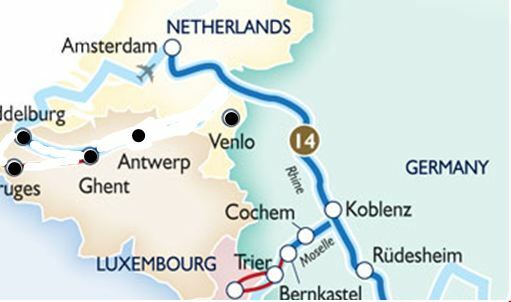 We will make our way from Amsterdam in the Netherlands to the cities of Cologne, Germany, Cochem on the Moselle River, Bernkastel, the Grand Duchy of Luxembourg and through the beautiful castle-lined Rhine Gorge to Rudesheim. Scenic Tours is relatively new to the river cruise business in Europe, but they are getting ready to launch their sixth river cruise ‘spaceship’. The Austrailian-owned river cruise line is making interesting modifications to this ship. This new ship, named the Scenic Crystal, will have enclosed balconies. Scenic was the first river cruise line with real, step-out balconies and by enclosing them when the weather turns, it gives cruisers even more cabin space. The glass panels of these “Scenic Sun Lounges” can be raised or dropped depending on the weather with just a push of a button. “We asked our ship designers to wow us and they did more than that with the Crystal — as it goes beyond any other river cruise ship in comfort and technology,” said Scenic Cruises founder Glen Moroney. Crystal Dining will be the main dining room on board with a fine dining restaurant called Portobello and a casual breakfast-and-lunch venue dubbed the River Café. The ship will also have bicycles that you can take ashore at no extra cost along with a small 24 hour fitness center. The staterooms will range in size from 164 to 315 square feet. Staterooms and suites come equipped with the modern amenities found in leading European hotels: Apple technology in the television system, wireless Internet throughout the ship, Egyptian cotton linens, full showers, L’Occitane toiletries and glass-fronted bar fridges. A fleet of pedal bicycles and electric bicycles are available for free use by guests. On many river ships you occasionally feel the vibration from the engines —that’s just part of the small size of the ship. Scenic is attempting to dampen that sound with a new rubber structure and double-insulated enclosures. The new ship will ultimately sail the 8-day Gems of the Danube (from $3,245 to $5,615 per person, double occupancy); the 11-day Gems of the Danube and Prague ($4,415 to $6,785); and the 15-day Jewels of Europe between Budapest and Amsterdam ($4,895 to $10,915). Prices include airport transfers, soda, beer and wine at lunch and dinner and gratuities. The ship will also be as long as is possible on European rivers, which makes for staterooms and suites that are about 25 percent larger than equivalent accommodations on other river cruise lines. Up on the top deck, the added ship size creates the largest lounge and dining area of any river ship–with three viewing areas. The extra space also makes it possible to offer a choice of three dining rooms, including The Show Grill, where guests can watch chefs preparing their meals. Jolly Mon will be blogging and adding photos during the trip to our facebook page at: www.facebook.com/rivercruiseguru and www.facebook.com/jollymonvacations so please LIKE our pages and follow on our adventure. We are, Jolly Mon Vacations and The River Cruise Guru. We offer FREE river cruise planning as well as all other vacations. Call now to begin your own river cruise! Welcome to Jolly Mon Vacations Blog!